30 Day Low Carb Diet - Discover an added amount of energy you may not have felt in years, all within the very first days of the program. 177 Ways to Reduce & Burn Calories - Lose Weight the Right Way by Burning Calories. 101 Steps to Better Health - Tips for both health and fitness that will htips for both health and fitness that will help you lose weight, discover ways to maintain a better healthier lifestyle help you lose weight, discover ways to maintain a better healthier lifestyle. Low Fat Recipes - Low Fat Recipes for a Healthy Life Style. Salad Recipes - The Ultimate Salad Recipe Collection gives you more than 350 easy-to-follow recipes, including both classic favorites and fresh new ideas. Inside you'll find salads designed to suit any occasion throughout the year. Fish Recipes - Collection of Fish and Shell-Fish Recipes. Home Vegetable Gardening - After you have tasted how delicious homegrown vegetables are, you will never settle for that ordinary store-bought produce again! Organic Secrets - You'll get over 40 chapters that explain in plain and simple terms how to become 'Organic'. Smoothie Recipes - 150 Recipes, All Very Easy to Make. Practical Lessons in Yoga - How Yoga can significantly reduce stress faster than any other method in the world! 97 Ways to Get Fit & Stay Fit - Be in the Best Shape of Your Life. Stop Smoking - You Owe it to Yourself. Bonus 5 Part Atkins Diet - You will never have to wonder what to have for dinner, lunch, breakfast or snacks again! 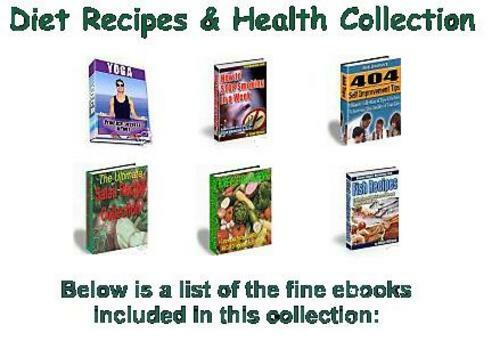 This is not a complete list - there are hundreds more recipes in this great eBook! The easiest way to count your carbs, no matter what diet you're on, is with Dr. Atkins' New Carbohydrate Gram Counter. BONUS Free eBooks with every order! Over 1000 Free ebooks, grab as many as you like. Contact me for your access once your order is complete. Not only do you get this fantastic eBook, but you can now resell it to your own customers for profit! Charge whatever you want and watch the money roll in. Make your investment right back with your first sale! To make it easy for you, I will even include the eBook Covers and Sales Page, all you have to do is upload them to eBay and you're ready to sell! The Complete Library Of Cooking! 5 volume set. Free Ebooks For Kindle, Personal Use Rights Included!